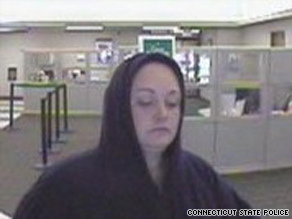 NEW YORK (CNN) -- Police in Connecticut say they have arrested a woman suspected of robbing at least six banks in the past week. Police released photos of a suspect in the robberies of six New England banks. Detectives from the Major Crimes division of the Connecticut State Police took Heather Brown into custody at about 3:15 p.m. The 34-year-old resident of Norwich, Connecticut, will be formally charged with robbery in the first degree, police said. Investigators believe Brown robbed the banks, often while claiming to have a bomb. "When she goes into the banks, she gives the teller information through a note or verbally that she has a bomb," said Sgt. Jim Keeney of the Connecticut State Police. "However, there haven't been any reports of an actual bomb." Authorities say they believe the woman has held up banks in the Connecticut towns of Middletown, Montville, East Hartford and Windsor, as well as banks in West Springfield, Massachusetts and Westerly, Rhode Island. Women commit 6.2 percent of bank robberies nationwide, up from 4.9 percent in 2002, according to recent FBI figures. The one-woman crime wave in New England apparently began September 21 at the Citizens Bank in Montville, Connecticut. State police said "a lone white female ... entered the bank with a bag in her possession. The suspect approached the teller indicated she was in possession of a bomb and demanded cash." WTNH: Will serial bank robber strike again? The woman left the bag on a counter and bolted, police said. Four days later, a woman entered a branch of the New Alliance Bank in East Hartford, Connecticut. Investigators with the East Hartford Police Department said she "left a note indicating that she had a bomb and demanded $1,000. She fled the bank with an undisclosed amount of money." Police suspect she struck again the next day in Windsor, Connecticut.